Sometimes you don’t have to go far to make great photos. 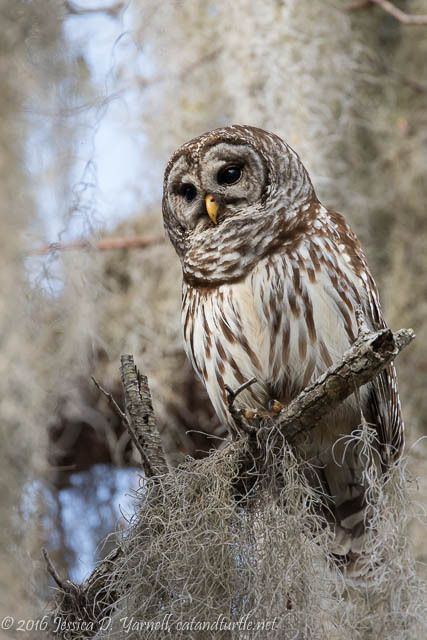 When I headed out for a walk at the Circle B Bar Reserve recently, I found some of the best birds just minutes from my car. For example, there was a great mixed flock of little birds in the oak trees in the parking lot. As soon as I got out of the car, I grabbed my camera and started shooting. 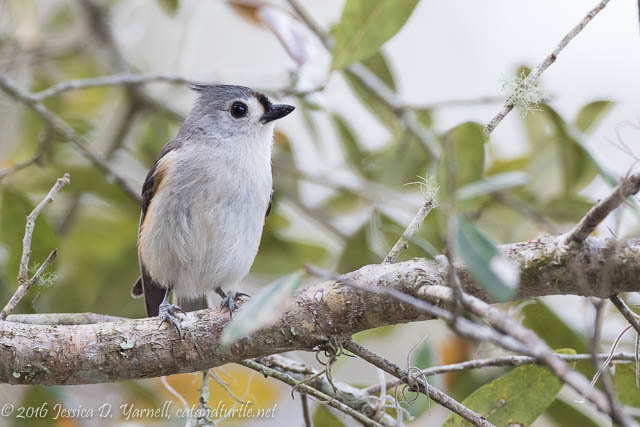 A Black and White Warbler, a Northern Parula, several Yellow-Rumped Warblers, a Palm Warbler, a bunch of Tufted Titmice…people stopped to ask what I saw, and seemed surprised when I said I was photographing the Tufted Titmice. 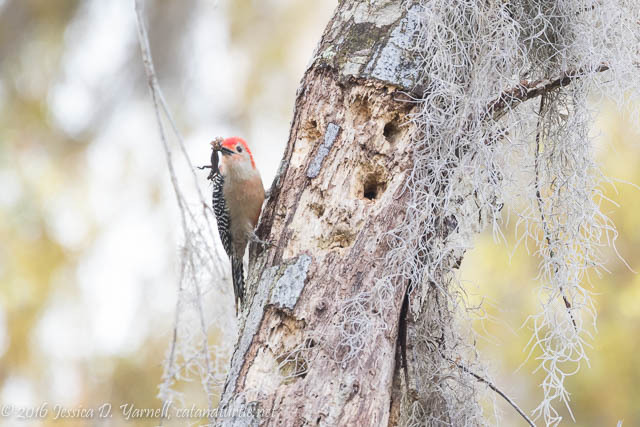 Yep, sometimes the common birds can be the prettiest, especially when they are flaunting their spring colors. You never know when the “boring” birds are going to do something interesting, like grab a spider in mid-air. I gasped when I saw this image on the back of my camera – I can’t believe it actually came out in focus! He grabbed the spider and took it to a branch to eat. Yummy breakfast! 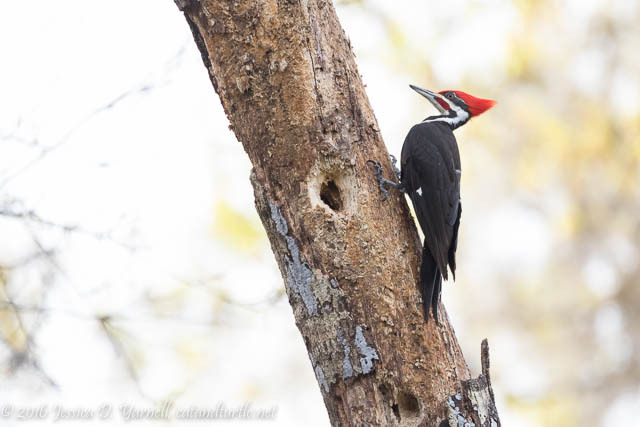 A Pileated Woodpecker flew in and inspected a hole in a dead tree. I’m not sure if this bird belongs to the nest in the palm tree by the nature center. I headed off for a nice walk around the Alligator Alley trail, which takes you down by the lake. The winds were strong by the lake, and it was just a glorious day to be outside. 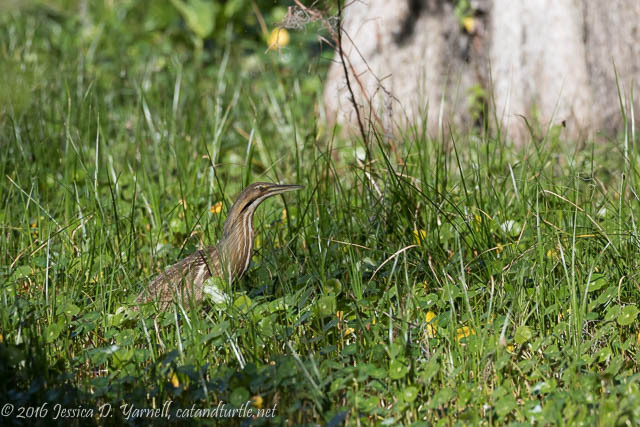 As I rounded the bend by the eagles’ nest, I came across an American Bittern stalking his prey in the tall grass. Thanks to the photographer who pointed him out to me! 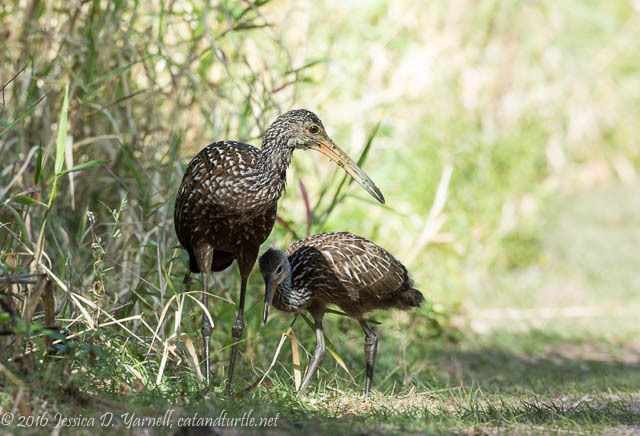 The babies in the Limpkin family have gotten a lot bigger since my last visit. 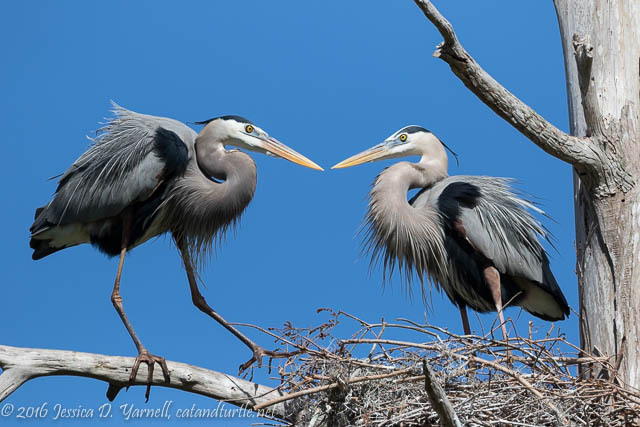 You can hear the family before you see them, thanks to the little calls of the babies. Two of the babies were up on the trail. One got fed an Apple Snail by mom. 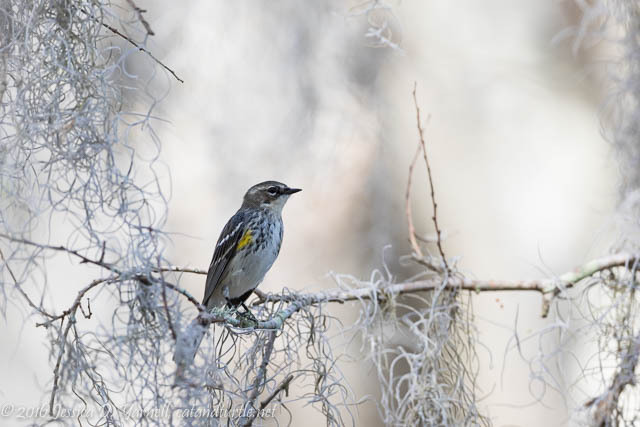 Just like my last visit, I saw lots of Yellow-rumped Warblers hopping in the trees along Alligator Alley. I heard plenty of Northern Parula songs, too. Spring was definitely in the air! Nice photos! 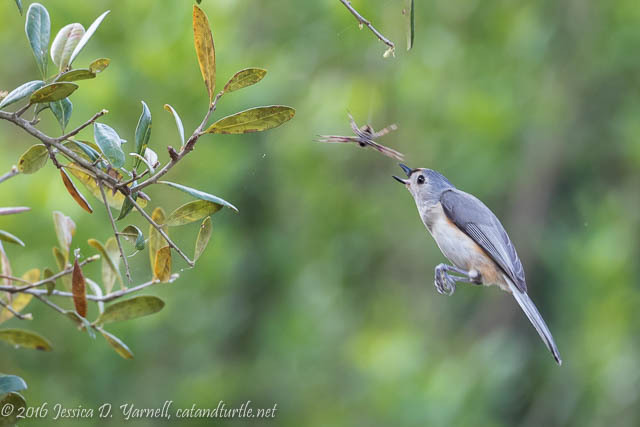 I like the one of the Titmouse diving. Happy Resurrection day! ~ Dan C.
Looks like you had a great outing. Maybe it’s time for me to make a return. I haven’t been there since we saw the broad winged hawk a couple of years ago.